The serviceability of a Stedman Machine Company is second to none. Standard service can be performed with common hand tools. We have product contact points available in carbon and stainless steel. Our rock crusher machines can be rebuilt over and over, saving you money. The special combination of features in a Stedman Hammermill is the result of over 90 years' experience in the field. 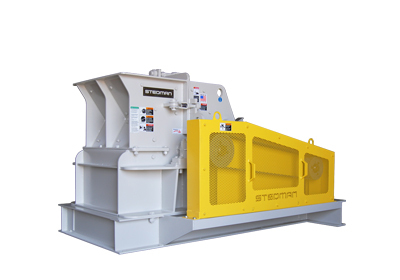 Wood hammer mills, also called wood hogs are special heavy duty Stedman Hammermills specifically designed to process wood and fibrous waste without the use of high maintenance knives. Our machines have simple designs with rugged construction that make them easy to operate and maintain. If it can be crushed, ground, pulverized or mixed, chances are we’ve done it. Contact us to arrange your full size hammer mill test today. To learn more about what to expect from testing, read this article that ran in POWDER BULK ENGINEERING magazine. "Up running" mills provide multiple size reduction stages for friable materials while "down running" mills are most suitable for fibrous materials.